West View of Peddy Naeg Droogum. bl.uk > Online Gallery Home	> Online exhibitions	> Asia, Pacific and Africa Collections	> West View of Peddy Naeg Droogum. 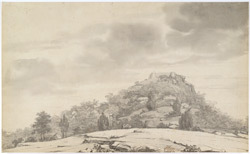 This is a wash drawing of the fort at Peddy Naeg Droogum by Robert Home (1752-1834) in 1792. It is one of a series comprising 22 loose drawings together with a map and three plans completed by Home when he accompanied the British army under Cornwallis during the 3rd Mysore War 1791-1792. The fort at Peddi Naig Droogam was situated at the head of a pass through the Eastern Ghats between Amboor and Vencatighery. British troops cleared the pass in March 1791 so that reinforcements could be provided to Lord Cornwallis.